A defunct Chinese space lab came to a fiery end over the South Pacific in the early hours of this morning. The 8.5-tonne Tiangong-1 space station mostly burned up over the vast ocean after re-entering Earth's atmosphere at around 1.15am. Along with scientists at China's space agency, teams from around the world closely monitored the lab's final minutes. Experts said the likelihood of debris striking anyone on the ground was "extremely small", however precisely where the torched remains would land was unknown. Estimates of when and where the re-entry would begin also varied. With accommodation for two astronauts, China's first space station blasted into orbit on board a Long March rocket in 2011. The last crew left in 2013 and Tiangong-1 - translated as Celestial Palace 1 - reached the end of its operational life in 2016, gradually getting closer to Earth ever since. The China Manned Space Engineering Office said that most of the 10m-long, 3m-wide space station's components were "ablated" during re-entry. The agency said: "Through monitoring and analysis by Beijing Aerospace Control Centre and related agencies, Tiangong-1 re-entered the atmosphere at about 8.15am, 2 April, Beijing time. "The re-entry falling area is located in the central region of the South Pacific. Most of the devices were ablated during the re-entry process." The US Joint Force Space Component Command (JFSCC) also confirmed the Tiangong-1 had re-entered the atmosphere over the South Pacific after coordinating with counterparts in the UK, Europe, Asia and Australia. 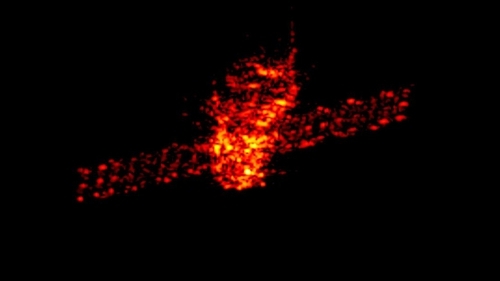 The European Space Agency said the Tiangong space lab entered the atmosphere "not too far from the uninhabited area that is typically used for controlled reentries". From the Vandenberg Air Force Base in California, Major General Stephen Whiting said in a statement: "The JFSCC works alongside government, industry and international partners to track and report re-entries... because the space domain is vital to our shared international security interest. "One of our missions, which we remain focused on, is to monitor space and the tens of thousands of pieces of debris that congest it, while at the same time working with allies and partners to enhance spaceflight safety and increase transparency in the space domain."